Melissa McBride is a former casting director and American actress that was born on May 23, 1965 in Lexington, Kentucky, USA. Melissa started her acting career in television in 1993. She played Darlene Kellogg/Waitress in TV series Matlock (Episode: "Matlock's Bad, Bad, Bad Dream"). She then went on to acting in a number of television movies and series. Her first directing gig was in the 2000s in Atlanta, Georgia where she worked as a film and commercial casting director. Director Frank Darabont gave her a significant role in The Mist (2007) and later picked her for AMC's The Walking Dead (2010). 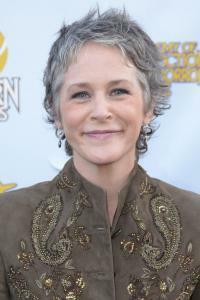 Melissa is best-known today for her role as Carol Peletier in the AMC television drama series, The Walking Dead. She moved to Atlanta, Georgia in the 1980s and began her professional acting career in Atlanta, Georgia in 1991. Some of her acting was seen in commercials including Rooms To Go and Ford for a few of years. Melissa did not audition for her role in The Walking Dead and so she thought it was a temporary job. She played the role of Carol Peletier, who is a middle-aged widow that was a caring mother to her daughter Sophia. She evolved from a weak, insecure female to a strong minded, independent female that does not need anyone to stand up for her. I love the character she became. She is an amazing actor that the audience throughout the world fell in love with. Melissa was supposed to be dead in the episode "Killer Within", but things happened and she went on to being in more episodes. She became famous for her role in AMC's The Walking Dead series that she appeared in the 2014 San Diego Comic-Con International.